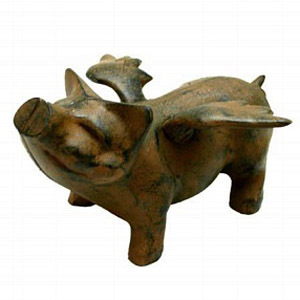 One our favorite little cuties, our baby flying pig statue comes in a rust finish and will surely add an adorable ornament for a desk or office decor. Shown with his delightful wings, he stands strong and stubborn for display!Created for indoor or outdoor use. Finish: Country Rust as shown. Normally ships in 1-2 weeks. SOLD OUT but we recommend the piece below with a colored finish.